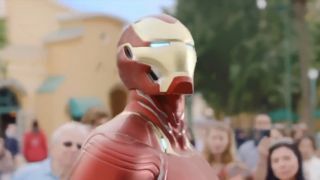 Check out Iron Man's (possibly shape-shifting) Infinity War armor in this... Disneyland commercial? So, here's the really cool thing: it looks like the Iron Man Infinity War armor will be based on the Model Prime armor from the comics. A relatively recent invention, the Model Prime suit was introduced in 2015 as part of the "All-New, All-Different" Marvel reboot, where most of the publisher's line-up reverted back to issue #1 as new storylines were formed. Unlike the big, heavy, chunky style of yesteryear, the Model Prime is sleek, lightweight, and modular. It operates based on molecular nanotechnology mumbo jumbo *waves hands*, but what this means is that it can basically shapeshift and take on different properties. That's (presumably) why you see those strange cannons in the leaked concept art, as well as the wing-like extensions coming off his back. That could also explain the presence of an arc reactor on Tony's chest in the movie, which was surprising to see given he had that bit of tech surgically removed from himself in Iron Man 3. In other words, the little bit of blue we've seen peeking out from under his hoodie could just be what the armor 'unfolds' out of, kind of like how a glove formed from a watch in Captain America: Civil War. For more MCU fun, why not join us as we recap the last 10 years of Marvel Studios movies, or speculate the Avengers 4 title?